Earlier this month we were introduced to a great online documentary series called “This Built America.” During our first visit they took us North to Alaska to meet “The Great Alaskan Bowl Company.” This time around, This Built America takes us to Texas to visit Collings Guitars. 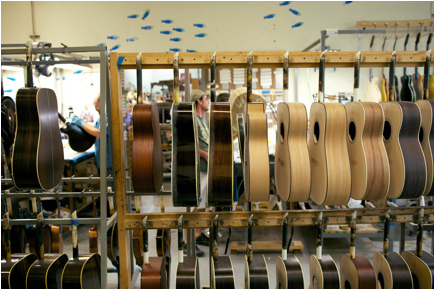 Collings Guitars is a stand out because of their choice to use a handmade manufacturing process versus wide scale automation prominent elsewhere in the industry. To put things in perspective, a Collings instrument takes about 55 hours of man power to produce, while their bigger competitors spends on average 4 -5 hours on a guitar. Over the years that attention to detail has earned Collings a loyal fan base that includes the likes of Joni Mitchell, Lyle Lovett and Zac Brown—to name a few. Owner Bill Collings employs craftspeople from all backgrounds to bring his stringed instruments to life. One of the rising stars of his mandolin department studied at Texas A&M to become a structural engineer. The mastermind behind the 2005 launch of his electric guitar line came to Collings with no formal training, but a degree in anthropology and a love of building things. For Collings Guitars, representing Texas in This Built America is another testament to their hard work and American spirit. To see more videos and to read the full article, including some amazing photos of the shop and guitars in various state of construction visit This Built America episode no. 28 Collings Guitar by clicking here.